If the power went out tomorrow, would you be prepared? If disaster strikes in the form of a national crisis, could you survive? It is very important to know the answers to these questions ahead of time. It could mean life or death someday! Thankfully, you do not need to be inconvenienced to be prepared. Many steps to being ready can be taken each day, along with normal activities. Your main concern during an emergency of some kind would be food and water. Without these, you can only survive a few days. So it's important to keep a good supply of both all the time! You have several options for storing food ahead of time. Buy just 'one more' at the store. When you go to the grocery store, buy an extra of whatever you are planning to buy in boxes or cans. Keep a running list of all the extra food you have on hand, and be sure to rotate frequently! If you buy one can of tomatoes, buy one more and set it aside. After a few months, use that can of tomatoes, go to the store, and repeat the process. This keeps food fresh, so you do not have an eight-year old can of green beans on the shelf! These foods can be kept on the shelf for a long time, and are good for an emergency, since you do not have to prepare them. They can be eat right out of a box! You may shy away from this option, since it sounds hard … but please do not! It really is not as hard is you may think, and it opens endless possibilities for emergency food storage. For starters, you can can soups, vegetables, fruits, jams, jellies, pickles, beets, corn, chicken, beef … anything, you name it. There are pretty much no limits to what you can reserve! That is what makes this options so nice and versatile. If you'd like to learn how to can, there are a lot of great resources out there for you. For one, check your local library for books on this topic. There are lots of great books out there about cannning and preservation. Also surf the net – there are hundreds of websites about canning that can help you. In any case, definitely look into cannning! Dehydrating is a fun thing to do with fruits. You can either slice your fruits, such as bananas, strawberries, cherries, apples, etc, into slices and dehydrate; or you can make home made fruit leathers. To make fruit leathers, simply puree your fruits with a bit of water and pour onto dehydrating sheets. Dehydrating these takes a day or two; but they are so delicious and very worth the effort! When you dehydrate fruit leathers, you should chill them to keep them fresh, and to keep them from going bad. Freezing is not as good of an option for food storage, since, in an emergency, you may not have power – which means freezers are going to go dead. So limit your frozen food storage, since it may not be helpful in all cases. If you live in a rural area, you may own your own well, which is a good start. Consider storing water into large storage tanks as a back up if you ever lose power. Remember, without electricity, you will not be able to run your well. If you live in the city, than you should buy large flats of water bottles – just enough for a month. Figure out how many water bottles each member of the family would go through each day, week, and so on, and buy this many bottles of water. Being prepared for an emergency is something that you should not pass off as unimportant. 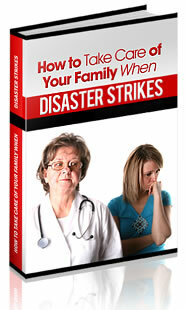 When disaster strikes, be ready for it!